By Andrew Norton | The global goals, which UN members signed up to last year, are for all countries, not just poor ones. How is the UK going to implement them? 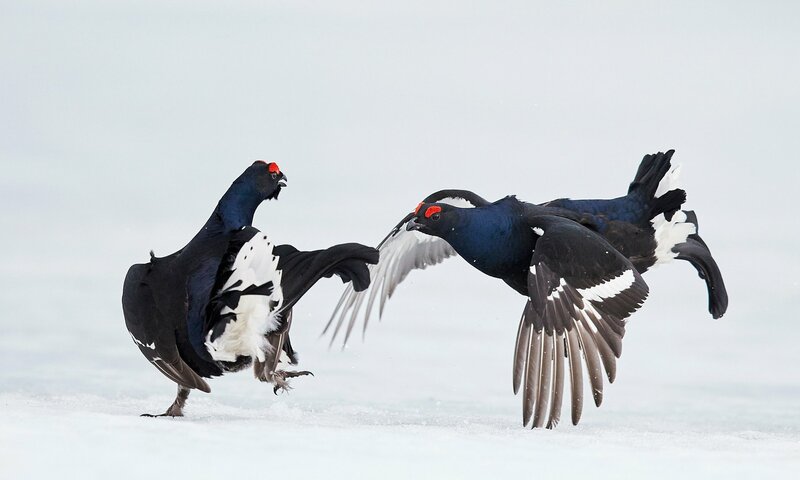 Black grouse fight in Vaala, Finland. The country is committed to protecting biodiversity under its implementation of the sustainable development goals. The first top-flight UN meeting on the sustainable development goals (SDGs) since they were adopted last year marks a key moment for the implementation of the ambitious 15-year blueprint. The theme of this year’s high-level political forum in New York is “leave no one behind” – a fundamental principle behind the global goals.aunching the first global report on the implementation of the goals, the UN secretary general, Ban Ki-moon, said this week that the enterprise had “got off to a good start”. Yet there is considerable unevenness, with some countries and areas making striking progress and others, less so. The SDGs replaced the millennium development goals (MDGs) in September 2015. Comprising 17 goals and 169 targets, they have been criticised for being too broad and all encompassing. But they have the merit of uniting the big global challenges of our era – halting climate change, arresting the loss of natural assets, stopping the upward trend in country-level inequality, and ending extreme poverty – in a single framework. This global dimension marks a change from the MDGs, which focused on poverty and human development. All countries, rich and poor, need to act. The MDGs were implemented mainly through resource transfers from rich to poor countries, including debt relief. The SDGs require integrated national planning for all countries. This universality principle, central to the SDGs, was absent from the MDGs. On the agenda for the forum is the presentation of country reports on implementing the SDGs. Nine of the 22 countries presenting plans and reporting on progress in New York this week are from the 35-member Organisation for Economic Co-operation and Development. The UK is not one of them. Britain’s international development committee, a parliamentary watchdog, has described the UK’s efforts on implementing the SDGs as “insufficient”. The IDC report criticised the British government for having no strategy for the SDGs, no implementation plan and no coordination mechanism. It also suggested that the Department for International Development may not be best placed for cross-governmental oversight and leadership, as its very name implies that development goals are primarily for other countries rather than the UK. Other OECD countries are doing better. Two examples are Finland and Germany, which both present progress reports this week. Finland has had a national commission on sustainable development since 1993, spearheaded from the start by the prime minister. This body is leading a process of rewriting existing development strategy to transform it into an implementation plan for the SDGs, which will be finalised this year. Guiding principles include “high-level political leadership, cross-ministerial coherence, long-term perspective, bottom-up planning, multi-stakeholder participation and continuous dialogue based on mutual learning and trust”. The institutional arrangements include an expert panel to advise the commission. A comprehensive “gap analysis” of Finland’s internal and external policies, programmes and budgets has been carried out to inform the final strategy. Early indications show that Finland’s specific challenges include safeguarding the welfare state as the population ages; high levels of greenhouse gas emissions per capita; protection of biodiversity; and sustainable, fair and efficient use of natural resources. The overall framing of Finland’s strategy goes well beyond government. By April, more than 240 actors from companies, ministries, schools, municipalities and civil society organisations had announced their own plans. At the launch of a report on poverty and environment in New York last week, I met Matti Nummelin, an environment adviser to the Finnish government, who said many Finnish companies had promised to promote sustainability at home and abroad, with a focus on operations in poorer countries. Germany’s report outlines an ambitious plan to implement the 2030 agenda across all policy areas nationally and globally. There is precedence here: Germany has been producing national sustainable development strategies since 2002 and, like Finland, has managed to engage its citizens in the process. The report is structured around what the 17 goals mean for policy, action and budgets at three levels: impact in Germany, impact on global wellbeing and support for other countries. The UK is used to positioning itself as a leader in development, both in ideas and practice. At the Gleneagles summit in 2005, the UK drove the mobilisation of aid budgets to support development in Africa. The UK is the only G7 country to reach the UN target of spending 0.7% of gross national income on aid, and the former british prime minister David Cameron helped design a framework to replace the MDGs. Theresa May’s first speech as prime minister was striking for its emphasis on tackling poverty and exclusion in the UK. The SDGs provide a framework for post-referendum Britain to act on inequality, environment and climate. If the UK does not join others in taking the goals seriously, it may itself be left behind. Posted by Above Whispers on July 22, 2016.